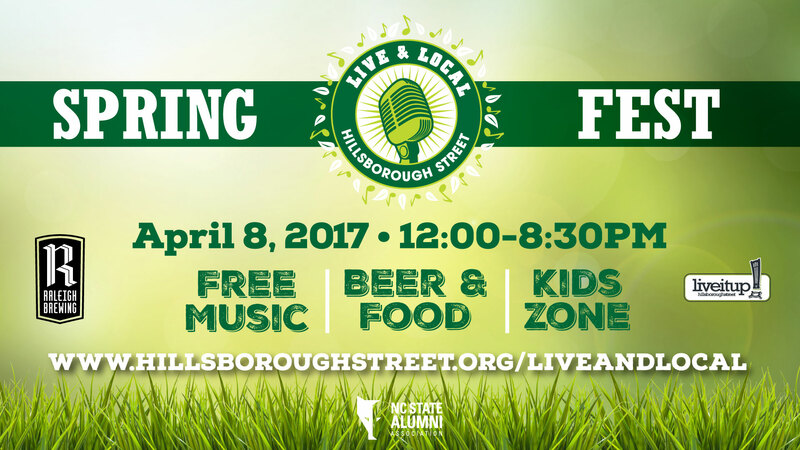 Chatham County Line will headline Live & Local: Spring Fest on Saturday, April 8, 2017. The previously announced free street festival will run 12:00 p.m. to 8:30 p.m. in the 2200 and 2300 blocks of Hillsborough Street and in Compiegne Park. The band lineup is comprised entirely of acts from the Triangle and includes Chatham County Line, The Amateurs, The Beast, Saludos Compay, The Affectionates, and Tea Cup Gin. “Chatham County Line is a fitting cap to the day and I could think of no better act that represents the whole ‘Live and Local’ ethos,” said Director of Programs, David Dean, for Live It Up! Hillsborough Street. Raleigh Brewing Company will be the exclusive sponsor of the Spring Fest Beer Zone, adding a hyperlocal focus of the festival. The full band schedule can be found online at www.hillsboroughstreet.org/liveandlocal. Full event schedule is available online, as well. Live it Up! Hillsborough Street is an independent 501(c)(3), not-for-profit municipal service district with the mission of making the Hillsborough Street community a distinct destination in Raleigh by providing services and programs that improve the economic sustainability of the territory’s businesses and increase the market value of its properties.